It is with heavy heart that we announce that our beloved Niles crossed the Bridge this past September. This has been a difficult time, and we are only now able to share his story with the List. The local newspaper published a wonderful tribute to Niles, but the article is too lengthy to set forth here, and thus we summarize. 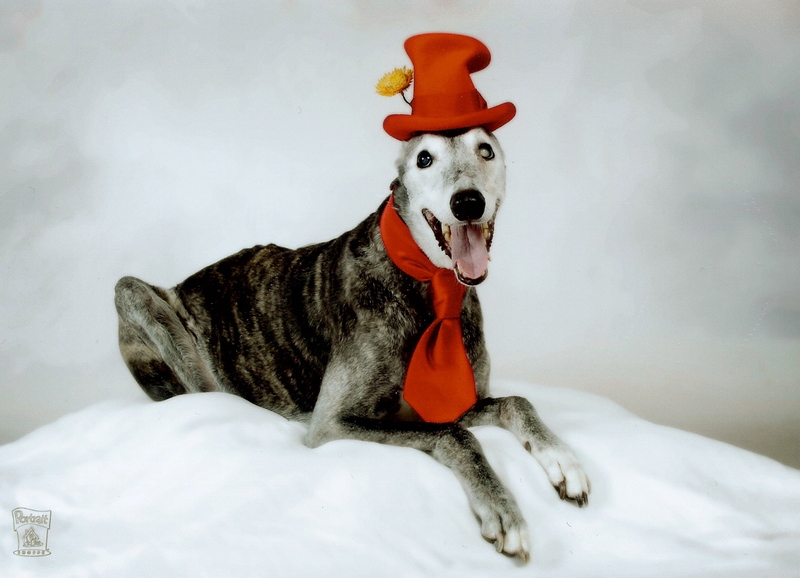 I suspect that much we say of Niles is true of all greyhounds, but he was our boy, and to us, he was the best. 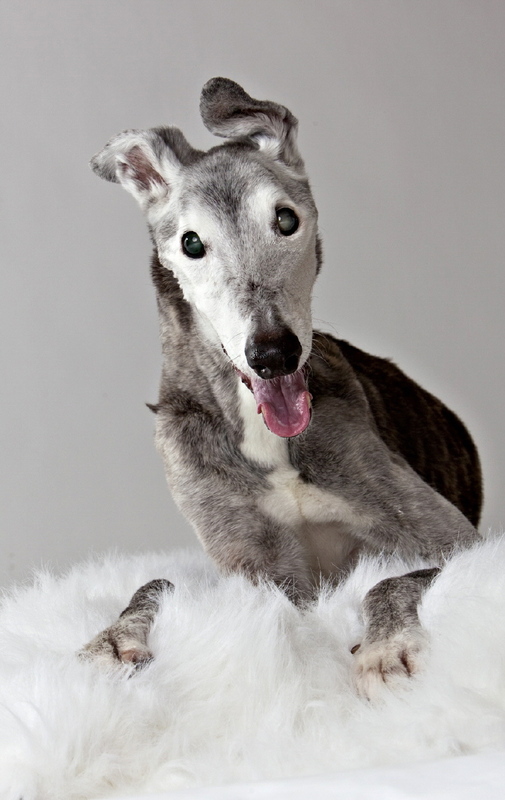 Born March 26, 1995, Niles was a dark brindle greyhound who first knew a life of kennels and races before adopting his loving Dads, Randy and Robert, on August 12, 2000. If ever it could be said that a pet did the adopting, this was indeed true. Promising to always care properly for this magnificent creature, Robert and Randy drove from their home in Lexington, Kentucky to North Carolina, where they were privileged with this adoption from Circle of Friends Greyhound Rescue. Such began the great adventure of the loving family of three. Niles was a member of the family, a child and not a pet. He was never caged, never boarded, and he expressed his appreciation in countless ways. Niles could make the most curmudgeonly person smile with a playful burp or flick of an ear. He lived for his ear scritches, nose kisses, and belly rubs. Niles was elegant and graceful, walking nimbly through rooms of furniture and glassware. His posture perfect, he floated across pavement, his natural gait that of a classically trained principal dancer. His fur smelled like none other, but more like a powder puff. Niles would not bark unless the occasion called for speaking, and yet he could sing the famous roo, his the most beautiful and emotive. Niles taught others to enjoy the simpler things in life. He would smell flowers for the sake of their wondrous fragrance; he would brush his face across the needles of pine tree limbs, trancing amongst their gentle tickles of his face. Niles longed to walk in the crunchy leaves of fall. He tiptoed through snow and sniffed the first blades of spring’s grass. Niles taught respect and tolerance. He would greet the homeless with the same enthusiasm as those with mansions; he paid no attention to political or other affiliations. Every person and every creature was interesting. Squirrels would scamper, chipmunks scurry, and rabbits run, all safe under his watchful eye and tilting head that expressed amazement at their activities. As he aged, Niles never complained about slowing down. He continued to enjoy his treats and short walks. He never cried, never appeared in pain. His eyes glistened until the very end. Niles was in my lap when he left us on September 30 at age 15 ½. We celebrate his life and the lessons he taught, the friends he made, and the reminder of good in the world. We love you, Niles. You were and always will be special. Dream wonderful things and always know you’re loved. You can read an article in the newspaper about Niles. Sending love to Niles, hoping he is safe and free of pain, looking down on us all and smiling with that beautiful grin.